2Hopkins Baltimore apartments are just a few steps away from all the culture in the Bromo Tower Arts & Entertainment District. The Bromo Arts District was established in 2012 and recognized as an area overflowing with potential. Anchored by the historical Bromo Seltzer Arts Tower, this area, stretching from Lexington Market to Antique Row, is filled with unique art, culture and restaurants on each corner. We’ve planned the perfect day to night in the Bromo Arts District – all walking distance from your apartment in Baltimore. Whether you’re hungry for breakfast or lunch, Lexington Market is a great option for all things food and it’s just blocks from 2Hopkins’ Baltimore apartments. This historical spot has all your food fixes, from fresh seafood and barbecue, to unique produce and baked goods. Stop by as early as 6 a.m. to beat the crowds. 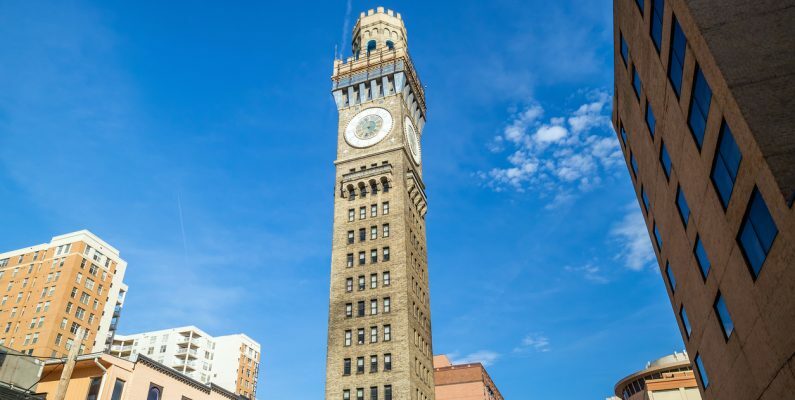 Next up is the famous Bromo Seltzer Arts Tower, which is open every Saturday from 11 a.m. to 4 p.m. See Tommy Roberts’ portrait series “Art of Jazz” and check out a celestial tapestry by The Dandy Vagabonds called “Moonifestations of Ancestor Earth: A Voyage of Expansion”. These exhibitions run until January 6 and 27, respectively. When you’ve finished with the current exhibitions, you can take one of four daily tours of the historic clock room. Or, after you’ve seen some local art, you can head north to one of two phenomenal local theaters – both less than a five-minute walk from these Baltimore apartments! The Everyman Theatre started from humble beginnings when it opened in Baltimore in 1990. Initially, they could only afford to put on one production per year. The theater has since transformed into a nationally renowned producer of art that remains affordable and accessible to everyone. The Hippodrome, sometimes referred to as “Baltimore’s Broadway”, opened in 1914 and was re-opened in 2004, after being restored and transformed into the state-of-the-art showcase it is today. See a touring Broadway show, a ballet, comedy shows and concerts at this beautiful, classic venue, mere blocks away from your Baltimore apartment at 2Hopkins. After soaking up all the culture of the Bromo Arts District, swing by Sugarvale cocktail bar for a nightcap. Stay as late as 1 a.m. and then catch a lift back to your 2Hopkins Baltimore apartment. There you have it! A perfect Saturday spent enjoying the cultural epicenter of Baltimore. Put yourself front and center in this new wave neighborhood and take a tour of 2Hopkins today.